Your students need clear, complete answers to their questions about grammar, research, and writing in the social sciences—and they often need them at a moment’s notice. As their teacher, you are their greatest resource, but you can’t be available 24/7. For help with work in class and at home and especially for questions at odd hours, students can turn to A Pocket Style Manual, APA Version. 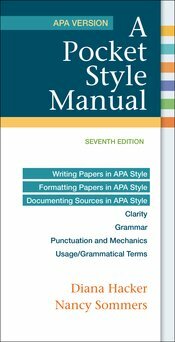 The APA version of A Pocket Style Manual provides help for students writing in disciplines that use APA style: psychology, sociology, economics, criminal justice, nursing, education, business, and others. With a focus on APA conventions and practices, examples and models from across the disciplines, and guidelines for integrating and documenting a wide variety of sources, A Pocket Style Manual, APA Version, gives concise, straightforward, and trusted advice for any writing situation. Our newest set of online materials, LaunchPad Solo, provides all the key tools and course-specific content that you need to teach your class. LaunchPad Solo for A Pocket Style Manual includes exercises, sample student writing, and LearningCurve adaptive quizzing. To package LaunchPad Solo free with A Pocket Style Manual, APA Version, use ISBN 978-1-319-04397-1.